A big FOR WHAT IT IS WORTH . . . . . . I thought I could do this quickly but . . . no. So, this is a start and may have omissions and mistakes. Some sequencers aren't represented as I only added ones I have some experience with or have studied a lot. Thanks for your valued input JLR ! This will be a great resource for anyone looking for seq specs..should be a sticky. JLR, Thanks for the info. Are you reconsidering the GRP now? It seems like a no-brainer. I'm glad to be on the list. I can't reconsider it right now, mainly due to lack of income and partially due to lack of space and time. I hope to get a R24 someday though! One problem with the wonderful modular boom is that manufacturers keep outdoing each other by packing more and more functionality into modules and you can pretty much spend all your time buying/selling/upgrading and never actually making any music. It's worse in eurorack land but 5U has had its share of "latest and greatest" temptations. ...and it's worth a lot!! Thanks John - this is really good info! This is really helpful - thanks for putting it together! This is very cool man. I'd add the RANDOM feature, unless the MFOS 16 is the only one that has that? This is great! I've been trying to compare the Q960 and M569 and it hasn't been easy. Now all I have to do is put the respective columns next to each other. Don't know about the others, but the dotcom Q119 also has a hidden random mode, which can be toggled by a combination of buttons. It really does look like the ultimate but not sure how feasible it is to make a wholesale trade-up (or if you are in the situation where you have nothing and were prepared to drop $1600). But if you have a q960 and the sequential switch already (I don't but always wanted that), maybe just pickup a 961s gate sequencer and you will find so much new functionality that you'll make some really great music or better yet, have a lot of fun !! But that's a great summary, John. Nice to see it all on one screen. You are missing the STG sequencer suite but it's unique features would result in additional feature rows which will only be checked for STG (and missing feature rows elsewhere). 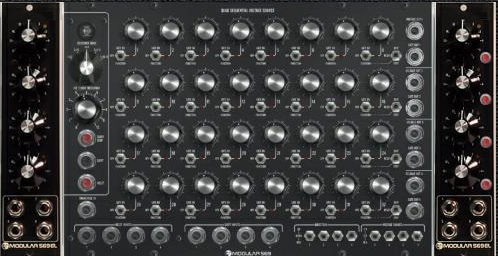 I still like that RYK Roland sequencer. The GRP is an 'everything and the kitchen sink in one' but RYK is something completely different and very live groove/fixed measure based. Thanks so much for this, John! Wow - Dang, you're plenty awesome, man. Thanks is the first order for sure. IF you are the Batman of sequencers and I want to be Robyn. Perhaps Master Po and Grasshopper is a better analogy. Part of my voyage into 5U was for the sequencers. I have been wanting that 960 experience. Wanting to go completely used this go around (as apposed to my Euro) I have grabbed some items. Thanks to EMwhite and Bryan B I have built most a Time Suite. I got it up and running yesterday and am very happy. Made a few basic sequences and really like the playability of it already. I remember reading the Moon and either Cotk or Mos-lab had a built in quantizer. The 4th row of the Moon is a bonus but the price is strong. I also noted someone said the spacing on the Moon was tight. It is the kind of thing where if I get any of these rolling I will be happy. Pros or cons in the 960 world? 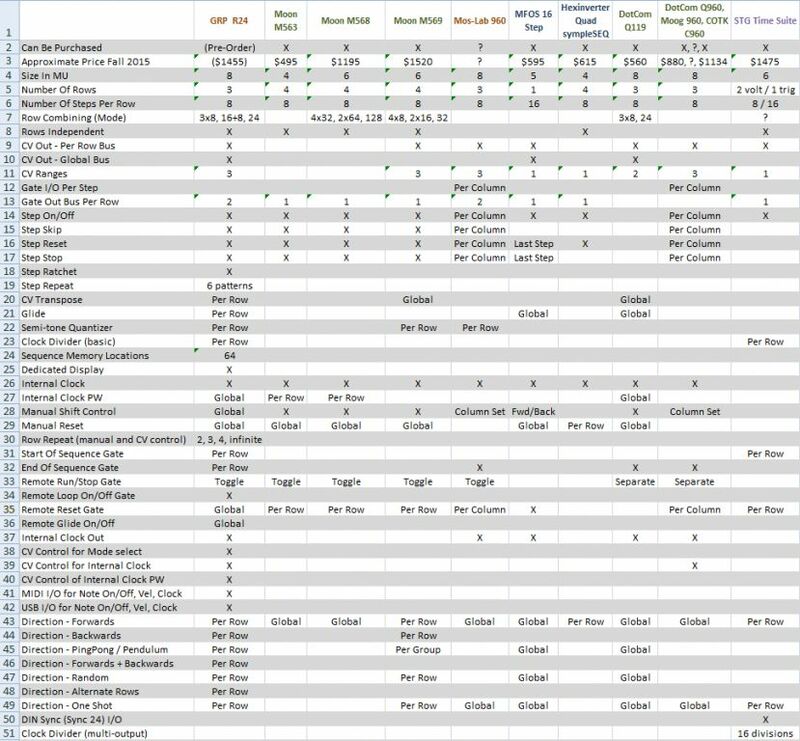 I updated the spread sheet and image, 11 more rows, more detail and some corrections. I reduced the font size and abbreviated some things to make generating the image more manageable. Doing this is MUCH more difficult than it would seem! Again, no disrespect for any manufacturers or models that are not on the sheet and I welcome anyone else who wants to add them! Trying to think how to add all the capabilities when aid/expansion modules are added to the sheet instantly hurt my brain so I didn't even try! It might be better to do a single sequencer per spread sheet and then show the difference in capabilities added with each additional support module . . .and different combinations of support modules . . . . I'd say go Q960, C961s and M564 . . .probably more money but same amount of space and better functionality. Costs more than the Q960 but it is set up to connect behind the panels to the C961s with a simple ribbon cable. Nope, very little is known at this point. With the M569 you really don't need the Q961 or C961s at all. Don't really need a Q962 or M564 either! The M563 isn't really that useful either with a M569 when you consider what it will give you and the cost and space needed. The M568 is a much better companion. Moon 569 and the proposed GRP R24 and Mos-Lab 960 have quantizers, the rest (in my spreadsheet) don't. Besides other things it makes it possible to emulate the 960 mo betta! It is tighter then a 960 type but not bad at all. Probably not nearly as tight as the GRP R24 from what I can tell. YES! ALL ABOVE ARE MY OPINIONS! I appreciate the time you took to respond to my questions. That takes a lot of work and is substantial knowledge and experience to share. People like you are what makes muffs so great! 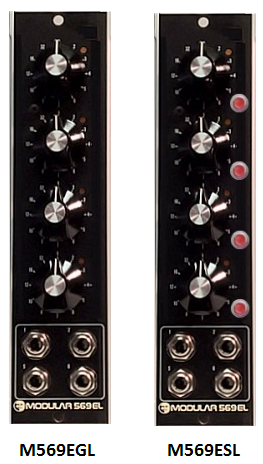 The Moon 569 does not seem as expensive when you factor in it takes care of the 961, M564 and has a quantizer. I also could sell ( gasp form a sequencer hoarder ) my OBK and Octopus. The Octopus was my first love affair with large format hardware but I have gotten so far away from midi in the last 5 years. It does ok with midi trigger to gates conversion for drums but without control over gate length it tends to gather dust. That's one instance where a M563 trigger sequencer would be useful to use with a M569 since the M569 doesn't have any internal way to control gate length. However . . . if you are using an external clock/VCO to drive the M569 and the VCO has CV control over pulse width, you can use one row of the M569 to create a different gate length on every step! This is super handy and it fits into my plan to take over the world. ... then what? The jacks are normalled to break to connection to the associated step number or is the 961 then 100% hardwired? Does the dotcom have anything over the COTK, maybe it doesn't have the hidden reset row feature on the n'th switch selection? That would be a handy time to have a 4th row. If I go with the 569 I will definitely get the 568 someday. I might have to sell a few less used pieces but that combo would be a powerhouse. What are your thoughts on the 569 expansions? 569 EG? Having separate outputs for every gate would be handy for some drums (vermona drm1 for example) assuming I could trigger them with the 569. It would be less relevant for that once the 568 is added. 569 ES would allow me to shorten sequence length with the 569 EG? Like the 960 trick of patching gate out into step reset? It would be fun to randomize that a bit with some logic or set it up on a sequential switch for some self playing patches. I am assuming both the 569EG and ES are supported simultaneously? 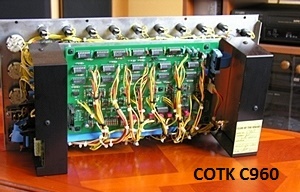 The COTK C960 is more expensive than the DotCom Q960 by about $250. The jacks are normalled to break to connection to the associated step number or is the 961 then 100% hardwired? I "think" it's connected all the time but I'm not sure. The COTK has the hidden reset feature but it is at the first unlabeled counter clockwise position instead of the clockwise unlabeled position like the Q960. 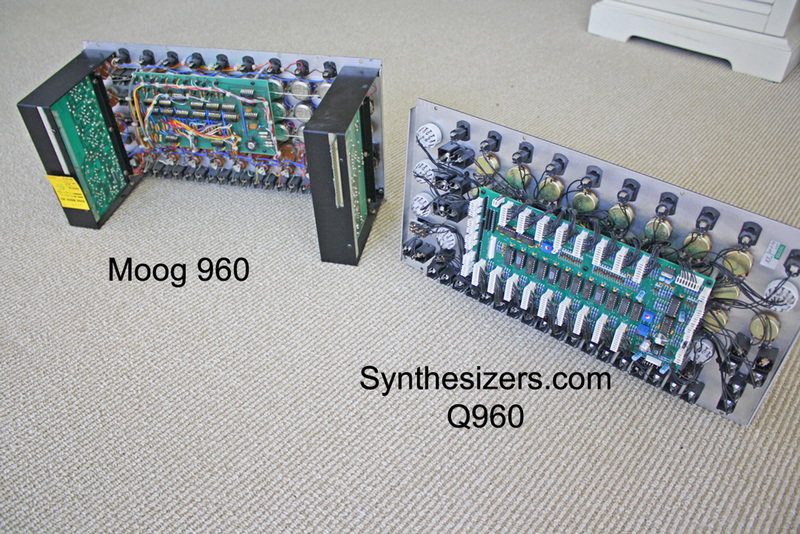 I've never tried a COTK C960 or Moog 960 but based on the one picture I've seen of the COTK C960, it is a more accurate looking clone of the Moog 960 with a main PCB and side planes that I "think" house the two additional PCBs like the Moog original. While all those extra parts in the COTK certainly explain the higher cost I don't know if all of the different brands operate and perform identically or not. I only have the 569ES so far. I think at the very least the 569ES is important to have because sometimes 'setting' to step 1 or 8 can work better as a reset than the actual Reset jack. Not always, but in some instances. For the way I do things I might often want separate gate or set position I/O for one or two steps per row, but almost never 3 to 8 per row. I thought about it a lot and mocked up "lite" versions of both expanders that are only 1 MU wide each. The rotary switches would select which step you want to set or get a gate from per row. There are 'off' positions adjacent to each step selection of the 12 position switch to make it more playable so you can for example switch between letting your gate source set to step 5 or not with a single click and not have to dial all the way through to a single position that is 'off'. The set module also has a push button per row so you can manual jump to the selected step. (similar to what you can do with the 960 type sequencers). And of course there are LED activity indicators. These mock ups of the 569 ES Lite and EG Lite aren't labeled correctly at all but the arrangement will give you an idea of how it might look. Not something for everyone as some folks who have the space and need would want to have the original full versions of course. I'd love to have these as it would make it possible to have a full featured sequencer setup in only 8 MU. I'm sure Gert at Moon is horribly busy, but if you think you would buy a light version of the 569 expansion modules, send him an email and ask about it! A MASSIVE salute to JLR for this breakdown! The Q960 has a "hidden" RESET selection on the chicken-head rotary. It is to the far right. The Mos-Lab (appears) to have the RESET in the far left position which is IMO a better place to put it. (next to SKIP). A missing "feature" on the spreadsheet is the "3rd Row Timing" switch. It is of course possible to do this with the fourth row of the 569 and still have three rows left like the 960. Set-Point 569! The 960 has OUTPUTS and INPUTS for each step already. The Gate ON time is 90%. I do think this is where the combination of the 960 and a 563 Trigger Sequencer is a magic combination. The Moon and SimpleSEQ sequencers have row independence unlike the 960 and Q119. The "trick" of patching the gate out into the step reset of the 960 is really not necessary on a 960. There is already a RESET position of the knob. The same with the Mos-Lab (I'll assume for now). This brings about another aspect I'd really be remiss in not pointing out which is the PLAYABILITY of a sequencer. The 960 has a proven track record of being playable in the reset/skip function aspect. Even though I realize it isn't everyone's cup-O-tea, a great example of this is the on-the-fly pattern changes in some of the classic Berlin School recordings. Listen to "Rubycon", "Phaedra", or "Ricochet - Part 1" (latter half). There is something tactile about the rapid changes of the reset/skip points on the 960 sequencer. Certainly there are more things to a step sequencer than pitch and rhythm duties but it seems that is what most players are drawn to. If so, then why not have the most stage or step flexibility? After all, the step sequencer is mostly used as a linear pitch change tool. Granted the 569 and SimpleSEQ have a big advantage in the independent row feature but I find the reset and skip control to be more useful. It's just a personal preference. Relating to how I use it in relation to any other instrument. I truncate or extend a "riff", bass line or linear melody on a guitar/keyboard more often than I work in a complex poly-rhythm. That doesn't devalue the ability to do so with a powerful step sequencer but as far as a performance instrument it is valuable. I'd consider the COTK C951 as well. An arpeggiator in a lot of ways can give you more mileage than a static sequencer. A listen to any Klaus Schulze or Michael Hoenig output will verify this. When you have to pre-conceive a RESET or a SKIP function with a separate switch before-hand then it can be less immediate. I can't imagine having to choose between SKIP and RESET by flipping a remote switch. Therein lies a difference I think is un-explored too often. Rarely does a sequencer come together in a way to make it playable like the 960. YMMV. I have mixed feelings about space these days. Part of me says just add more, the 8U racks are cheap enough and I have ample power. Part of me likes the idea of a more dense system after growing and shrinking in Euro. So just to clarify these are custom rework ideas you have and there is a possibility they could be built some day by Moon or another talented builder? Thank you, these are very relevant points to seemingly obvious things I missed. The gate ins and outs and the skip/reset switch on the 960 for example. The row independence of the Moon. I also appreciate the thoughts on the playability of a sequencer. The spontaneity of the 960 length/reset playability is very valid for the way I like to play my current sequencers. The addition of an arpeggiator is also a great idea. Sometimes the classic Devo synth lines I love so much sound more arpeggiated than sequenced and transposed. Again thanks for all the time and input. Feeling more and more like selling some stuff and trying both. I usually tell myself I will sell which ever one I like less but end up keeping both. Thankfully this has left me some modular equity to deal with situations like these.